I have completed the first week of stitches. See previous post for beginning of this challenge. On January 6th I stitches three rows of running stitches, the first and third are the same and the second if offset. Then I wove a thread through these stitches. If you have Constance Howard's Book of Stitches you can see the example which inspired me on page 19 curving down the center of the page. I then couched down a novelty thread. 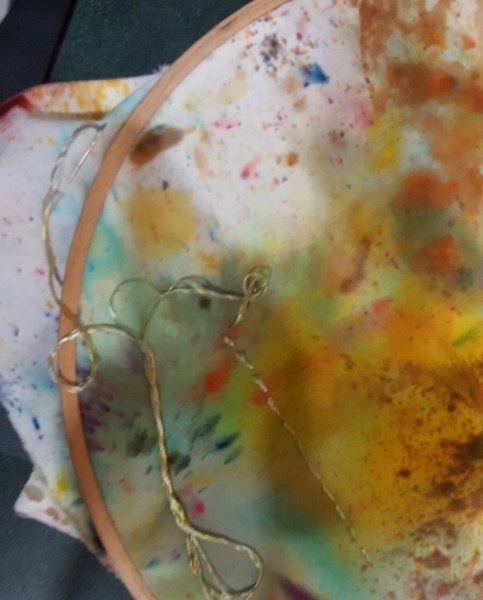 The thread I stitched with was also a novelty thread which had small knots in the thread which made it difficult to stitch through the more tightly woven background fabric. The first week is over and below is a picture of all the stitching I did on this challenge except for the chop which is visible in the previous post. 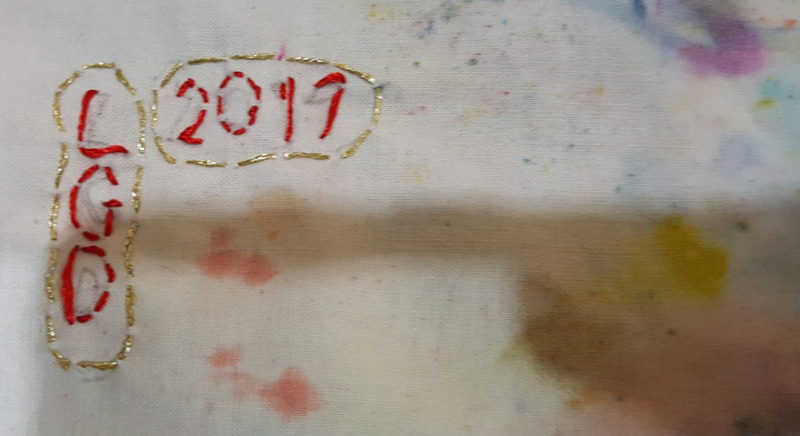 I have joined a group of fiber artists and embroiderers in a project entitled 1 Year of Stitches 2017. We will all be doing an embroidery project which will hopefully have us doing at least one stitch each day of the year. We will all be working toward different goals during the year. Goals include, but are not limited to, focusing on a project and seeing it to completion, learning to embroider, learning new stitches, improving embroidery skills and improved composition skills. I have two goals: complete the project and spend at least one week on a stitch to learn the variations of the stitch. Improving my skills should be a given if this project is completed. 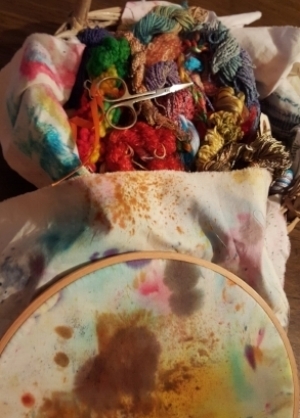 Basket of mostly hand dyed threads and hooped back ground fabric which is a dye clean-up rag. I am using Constanace Howard's book for my reference. I started on January 1st by adding my chop (a mark on goods). Chop of my initials and the year. January 2nd I added one row of running stitches. I will be working with running stitches for the first week. One row of running stitches done with hand dyed rayon 2-ply yard doubled to make 4-ply. January 3rd I added three more rows of running stitches. January 4th I watched Quilting Arts on PBS. One segment featured Laura Wasilowski making small embroidered pieces. One of the stitches she demonstrated was the weaving stitch which is rows of long single running stitches which become the warp and are woven through. I really thought it would be a great addition to my embroidery tool box so decided to give it a try using hand dyed pearl cotton. January 5th, back to Constance Howard's book to do long and short running stitches alternated in rows using the same pearl cotton I used yesterday.